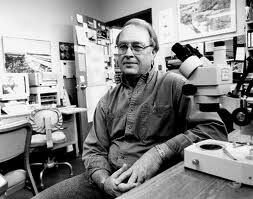 John Janovy, Jr. is a distinguished parasitologist and professor of biology who has the broadest philosophical interest in human encounters with nature and the education of young people. Janovy is the author (and illustrator) of some of the most admired books and essays in American natural history, among them, Keith County Journal, Return to Keith County, and Dunwoody Pond: Reflections on the High Plains Wetlands and the Cultivation of Naturalists. He is also a gentle humorist that can offer up a book like Outwitting College Professors: A Practical Guide to the Secrets of the System as a guide to getting a good education. Wednesday's program borrows its title from Janovy's most recent book, Pieces of the Plains: Memories and Predictions from the Heart of America, in which the author meditates on his experiences as a biologist, on our understanding of the natural world, and our future. The Program will begin at 12:10 p.m. on November 3rd, in the auditorium on the fourth floor of Bennett Martin Public Library at 14th and N Streets in downtown Lincoln. Please join us. 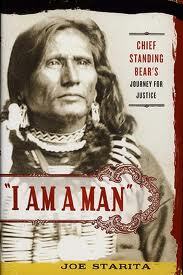 A new display on the second floor of Bennett Martin Public Library in downtown Lincoln celebrates the announcement that Joe Starita’s book, I am a Man: Chief Standing Bear’s Journey for Justice will be this year’s One Book/One Lincoln selection. 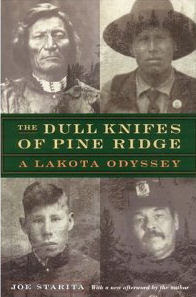 Other finalists were worthy, but Starita’s book offers a riveting story with deep roots in local and regional history. Joe Starita was born in Lincoln and studied English and Journalism at the University of Nebraska. He went on to become an investigative reporter at the Miami Herald and that newspaper’s New York City Bureau Chief. He is a former City Editor of the Lincoln Journal Star. He has been a Pulitzer Prize finalist for reporting at the Miami Herald, and his book, The Dull Knifes of Pine Ridge (1995) won him critical acclaim, local and regional awards, and a second Pulitzer Prize nomination. Starita teaches in the College of Journalism and Mass Communications at the University of Nebraska-Lincoln. Starita’s books are a distinguished contribution to a strong Nebraska literary tradition. Some of the earliest serious attempts to record and understand Native American experiences and to put the Plains Indians back into American history as real people were made by Nebraska writers. Our display represents a little more than a century of Nebraskans writing about the Plains Indians. In the best of these works, writers struggled to present the true voices of Native Americans and record their side of history in stories that seemed about to be lost to old age and death, or overlooked in a strong tendency to convert American history into a dull monument to virtue and Manifest Destiny. Real history, interesting history, is meaningful conflict, complex people who deserve to be understood on their own terms, mixed motives and light and shadow. While recognizing that the simple moralization of history is a trap that leaves us ignorant, from time to time, Nebraska writers have gently suggested that much is to be learned from the struggles of native people that sheds light on some of America’s more persistent problems at home and abroad. The display includes work by Starita, Eli S. Ricker, Mari Sandoz, John Neihardt, Melvin Gilmore, Amos Bad Heart Bull (introduction by Mari Sandoz), George Hyde, Donald Danker, Thomas Henry Tibbles, Hartley Burr Alexander, Alan Boye, John Wunder, and Stew Magnuson, among others. Glenna Luschei is a poet, publisher, editor, translator and (!) successful avocado rancher. Glenna grew up in Beaver City and Lincoln, Nebraska, and now lives in California. She studied at the Iowa Writers' Workshop, the University of Nebraska-Lincoln, and the University of California at Santa Barbara. 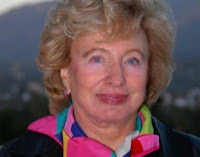 A well-published poet, see her book list here, she also founded the "ground-breaking" (Hilda Raz) poetry magazines Café Solo and Solo. In an appreciation of Glenna, Nebraska poet Ted Kooser recalls that his real success as a poet began with the publication of A Local Habitation & A Name by Solo Press in 1974. Glenna Luschei has been recognized as a pioneer in the small press movement, and in its effort to bring vital new work to the attention of readers. She has served as the Poet Laureate of San Luis Obispo, as a national panelist for the National Endowment for the Arts, and as a member of the San Luis Obispo County Commission on the Status of Women, among other positions. She has pursued and interwoven an amazingly wide array of creative, critical, and social commitment and influence. The program begins at 2:00 PM Sunday, October 17th in the Heritage Room on the 3rd floor of Bennett Martin Public Library in downtown Lincoln. Please join us to hear Glenna Luschei read.